8 Reasons : Why a business needs Digital Marketing? Home > Blog > Blog > 8 Reasons : Why a business needs Digital Marketing? 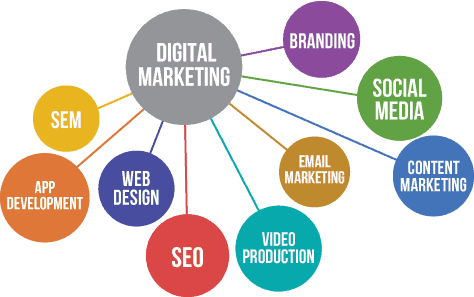 The term “Digital Marketing” was first used in the year 1990 and has since evolved to cover different elements of online sales and service, being more refined during the first decade of 21st century. The first ever website (info.cern.ch) was published on August 6, 1991 by British physicist Tim BernersLee while at CERN, in Switzerland. And now the total number of Websites over the internet has passed 952,518,350 in count and it is increasing with a speed of 5+ websites per second contributing to 320 websites per minute. Digital marketing differs from traditional marketing because it involves the use of channels and methods that enable a company to analyze its marketing campaigns and understand in real time what is and isn’t working. Here you can get the reasons for why you should go for online business and use digital marketing strategies to generate sales. 1. Digital Marketing has opened a trunk of opportunity for small and medium sized entrepreneurs (SMEs). Efficient use of digital marketing increases the chance to compete with the big names in the market in the same industry and attract their share of targeted traffic. SMEs have got new resources in the form of digital marketing to increase their sales and marketing processes that were previously available only to large corporations. Using digital media, SMEs can handle all the queries of their customers without establishing any call center for it. They can manage multiple customers from any part of the world virtually. 2. Digital Marketing is cost effective than traditional marketing. Basically in the initial time period, most of the SMEs have very much limited capital as well as resources and this is the reason why to step towards Digital Marketing. It gives SMEs a much more cost effective marketing channel. It can be seen in a survey result announced by Gartner that 28% of business owners surveyed will shift marketing budget allocations from traditional one to digital online marketing. 3. Digital Marketing delivers Conversion. There are two types of digital marketing companies. One delivering products and other delivering services. These businesses measure their success through the traffic coming on their website getting converted into leads or sales. If the incoming traffic is not getting converted into sale, then all the marketing effort taken get wasted. So it should be the primary goal of any digital marketing company to efficiently use different tools to convert lead in sale. Campaigns like social media marketing; email marketing and SEO can heavily increase the chances of conversion over the website. 5. Digital Marketing Caters to Mobile Consumer. Mobile marketing is going to be the next blast in the digital marketing. The rapid growth of mobile gadgets has inspired the digital marketers to target the clients using mobile marketing too. Mobile gadgets have evolved from being mere alternatives for laptops and personal computers, into something that is influencing their purchasing decisions. 6. Digital Marketing creates Brand Reputation. Providing a better service and offering a better range of products empower the brand name and creates a reputation of the brand among the customers.Once the brand reputation has been created, the customer becomesvalued customers.Delivering good quality product/service and solving their queries on promised timehelps a brand in gaining reputation and increasing their customer base.Hence the brand reputation will go viral as expected, further opening new doors of opportunities for reaching bigger markets and attain business growth. 7. Digital Marketing offers better ROI for the business. With better revenue and better brand name, Digital Marketing can deliver a far better Return of Investments (ROI) than any traditional marketing channels. The key to success in Digital marketing is to continuously generate a flow in traffic that gets converts into sales. The more traffic a business generates,fasterone can realize the ROI. 8.Digital Marketing Ensures Business Survival Online. Using a brick and mortar business establishment, one can’t ensure the existence of a business at a later time. People enter in the store, skimming through and inspecting the products, then leave without buying anything. If these kinds of people keep on coming regularly and leave the store without buying anything, then it will be very difficult for the business store to exist. This doesn’t happen with the online business. If people are not coming to your website then more strategies can be implemented to bring traffic and convert it into sales.